George Grosz (1893–1959) was a German artist known especially for his caricatural drawings and paintings of Berlin life in the 1920s. He was a prominent member of the Berlin Dada and New Objectivity group during the Weimar Republic. He emigrated to the United States in 1933, and became a naturalized citizen in 1938. Abandoning the style and subject matter of his earlier work, he exhibited regularly and taught for many years at the Art Students League of New York. George Grosz was born Georg Ehrenfried Gross on 26 July 1893, in Berlin to Karl Gross and Marie Wilhelmine Schulze. When Karl Gross' restaurant failed, the family moved to Stolp, a small provincial town in Pomerania, where he worked as a caretaker and steward of the Freemason's Lodge until his unexpected death in 1900. The widowed Mrs. Gross and the six-year-old Georg moved back to Berlin, trading their rural life in Stolp for the working-class district of Wedding, where Marie Gross earned a living by sewing shirts and renting rooms to lodgers. In 1902 they returned to Stolp when Mrs. Gross took a job as manager in the officer's casino of the Prince Blücher Hussar's Regiment. As manager, Mrs. Gross lived on the premises, which meant that Georg had close contact with German officers during his childhood. In 1908 the fifteen-year-old Gross was charged with insubordination and expelled from school because of a dispute with a teacher. He began his artistic education shortly thereafter, in 1909, at the Dresden Art Academy. Gross' first caricatures appeared in 1910 in Ulk, a supplement to the Berliner Tageblatt. He graduated with honors from the academy on 30 March 1911. Gross continued his artistic education between 1912 and 1917 at a school attached to the Museum of Applied Arts in Berlin and studied with the art nouveau designer Emil Orlik. From August to November 1913, he lived in Paris and took classes at the Atelier Colarossi, developing the skill of rapid sketching from models who changed their pose after five minutes. Such training proved to be invaluable for his art, and from that time forward he carried a small sketchbook in order to draw people and the busy street life of Berlin. 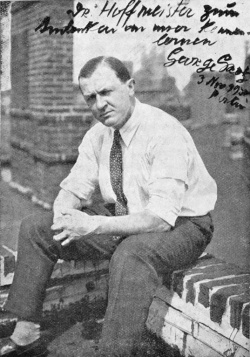 In November 1914 Gross enlisted in the military in Berlin, though he was released six months later for medical reasons. Gross met John Heartfield and Wieland Herzfelde in the atelier of the expressionist painter Ludwig Meidner in 1915, a meeting that resulted in a long, productive friendship. In 1915 he also published a poem and an illustration in Franz Pfemfert's radical leftist journal Die Aktion. In 1916 Georg Gross changed his name to George Grosz, thus anglicizing and slavicizing the spelling of his German name in an antinationalist protest. On 4 January 1917, Grosz was drafted into renewed military service. Just over a month later, however, he was transferred to a mental hospital in Görden and eventually discharged on 20 May 1917, as unfit for service. Thanks to the interventions of the diplomat and arts patron Count Harry Kessler, Grosz worked with Heartfield at the Military Educational Film Service (later called UFA) producing animated propaganda films. In 1917 Herzfelde's publishing company Malik Verlag produced the Erste George Grosz-Mappe [First George Grosz Portfolio] and the Kleine Grosz-Mappe [Small Grosz Portfolio], two collections of socially critical lithographs. Grosz, Herzfelde, and Heartfield joined the German Communist Party at, or just after, the First Party Congress, 30 December 1918-1 January 1919. Grosz also joined the leftist artists' group Novembergruppe in the same year. In addition to caustic caricatures, Grosz' work during the Dada period included the production of photomontages in collaboration with Heartfield as well as satirical journals, blending aesthetics and politics for a wider public. In 1919, for instance, Grosz cofounded the satirical magazine Jedermann sein eigner Fussball [Everyone His Own Soccer Ball] with Herzfelde, which was distributed by the authors on horse-drawn taxis preceded by a brass band. Authorities banned its further appearance. Undeterred, Grosz and Herzfelde began work on Die Pleite [Bankruptcy], another satirical paper, which was published until January 1920. Grosz' first one-man show was launched in Munich in April 1920, and a month later, he participated in the International Dada Fair and married Eva Peter. In April 1920 Grosz and Heartfield published an article called "Der Kunstlump" [Art Rogue] in Der Gegner [The Opponent], which provoked intense public debates about fine art and revolution. In June 1920, Malik Verlag published Grosz' portfolio of antimilitaristic drawings, Gott mit uns [God with Us], for which Grosz and Herzfelde were later charged and fined for insulting the German army. This would be the first of three trials in the early 1920s against Grosz on the grounds of public offense. Das Gesicht der herrschenden Klasse, Berlin: Malik, Nov 1921, 63 pp. Mit Pinsel und Schere: 7 Materialisationen, Berlin: Malik, Jul 1922,  pp. This page was last modified on 30 July 2018, at 20:59.